The spectre of revolution has returned to Georgia. 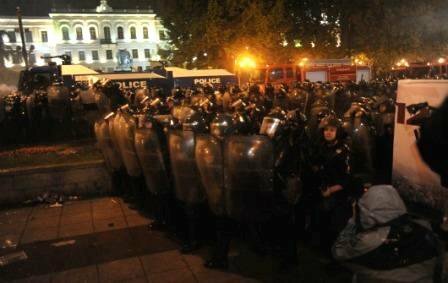 From 21-26 May, political demonstrations rocked the capital, Tbilisi, and Batumi. The mass protests were described by Nino Burdzhanadze, leader of the People’s Forum, former speaker of the Georgian Parliament and figurehead of the protests, as no less “the start of a revolution”. As perhaps might be expected, the official Tbilisi position sees things differently. Representatives of both the parliamentary majority and media sources loyal to the President have been quick to identify “the hand of Moscow” behind the demonstrations. This version of events is all the more popular among ordinary Georgians, since just before the protest meetings the Georgian Parliament unanimously passed a resolution recognizing the 1763-1864 massacres of Circassians by Russia as genocide (they did so after only three readings). The decision had of course little connection with the actual “Circassian Question”. 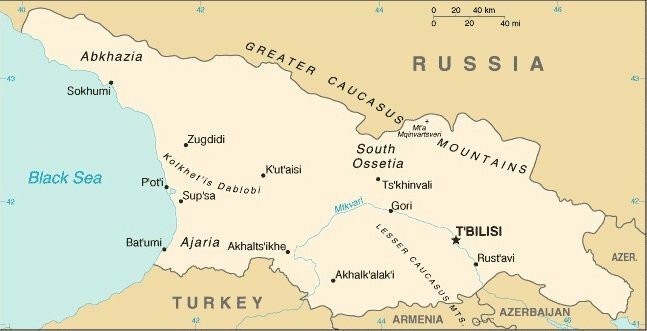 Tbilisi has tried to use the “North Caucasus Map” as a weapon of revenge on Moscow, using the recognition of ‘genocide’ as an answer to Abkhazian and South Ossetian independence. In one respect, these events have an air of déjà vu about them. Every action initiated by the opposition over the years has ‘set a deadline’ for the Saakashvili regime. This has certainly been the case in recent years: demonstrations organised by the president’s enemies have in general take place on the eve of important national holidays. The national holiday that this demonstration worked towards was the anniversary of 26th May 1918, the date the first ever independent democratic republic in Georgia was proclaimed (it existed only until 1921). That date has become a focus for the opposition (successfully or not is another question) and a serious test for the government. At the same time the noisy celebrations of each consolidation of opposition ranks barely have a chance to die away before new schisms split them again. The present stand off between Okruashvili and Burdzhanadze is just one more twist on an old story. The government, when dealing with the opposition, inevitably accuses it of having links with Moscow and of inconsistency in its choice of ways and means. That Nino Burdzhanadze — heroine of the current dramatic confrontation between government and opposition — visited Moscow after the ‘five day war’, and showed willingness to enter a dialogue with Russia is now used against her by the pro-government press. In general, post-Soviet Georgia is no stranger to revolutions and changes at the top. It is the only state in the European part of the former USSR which has known no peaceful handover of power. The first president of independent Georgia, Zviad Gamsakhurdia, left office after a military coup, a small civil war in Tbilisi and a large war in the Mingrelia region. The second president, Eduard Shevardnadze, resigned after allegations of fraud during parliamentary elections sparked the ‘Rose Revolution’. As for Mikhail Saakashvili, rumours of corruption have dogged him since the disputed count of votes for the Central Executive Committee in January 2008, during his second presidential campaign. And the constitutional reform he has initiated (proposing a redistribution of power in favour of the Prime Minister) has been widely regarded in Georgia as a variation on the ‘Putin scenario’, where Saakashvili would move into the role of head of government. The president has not (or at any rate, not yet) excluded this possibility. In other words, the present holders of power will continue to bear the burden of legitimacy. "The government accuses the opposition of having links with Moscow and of inconsistency in its choice of ways and means." Some unusual aspects of the present unrest are worth noting. The revolutionary sentiment the country witnessed in spring 2009 had, it seemed, already passed by completely. 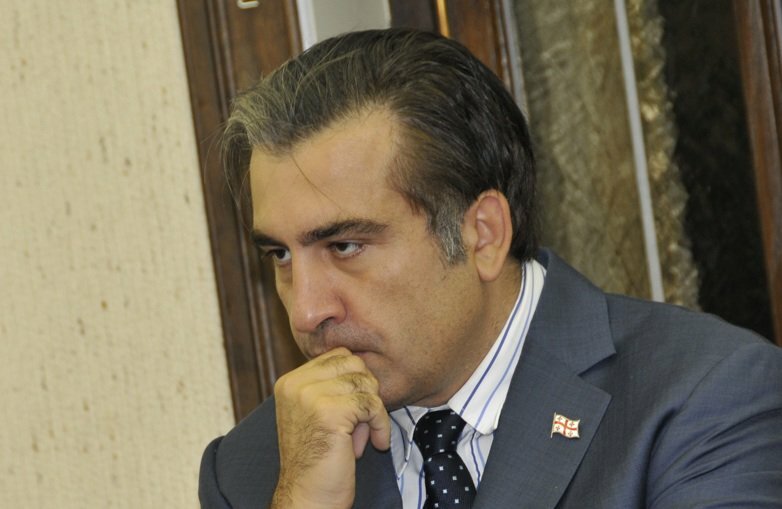 In May 2010 the government won the first direct elections for the post of Mayor of Tbilisi (in the person of Giga Ugulava, who is tipped to succeed Saakashvili), and thus gained control of its municipal government. At the same time Saakashvili experienced a ‘rebirth’ in international relations, receiving and visiting American and European leaders at various levels. It seemed that the outside world had taken on board the idea that power in Georgia was in good hands that would last the course, that the opposition was weak and fragmented and that any change was unlikely. However, discontent with the regime had not gone away. Especially since the authorities, as had happened before, interpreted the essentially pragmatic rapprochement offered by the USA and the EC as giving them carte blanche. Hence their ill-considered and at times reckless decisions. One example of this has been a growing military presence in Afghanistan, with concomitant loss of life amongst its troops. Another is its adventures in the North Caucasus, designed not only to mess up Russia’s activities there but to provoke her into an impulsive and irresponsible reaction (as had happened more than once earlier) and so bring her into conflict with the West (and especially the USA). In its internal politics, the main government initiative has been the proposed redistribution of power in favour of the Prime Minister, due to come into force after the elections of 2012-3. This measure was passed in a ‘quiet’ period, since after the completion of the local election campaign in May 2010 there would be a considerable period of time before the next round of electoral battles. The government believed that the opposition would be unable to mobilise itself during that time to fight the reform. The radical elements of the opposition thought otherwise. Burdzhanadze took the initiative, and although she did not win, she can’t be said to have failed completely. She almost immediately made an appearance on live television. Rallies of her supporters were shown on two national channels. 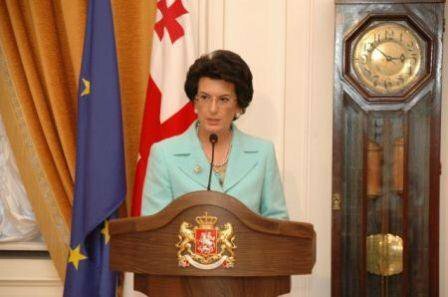 Another definite victory for the ex-speaker was the cooperation she received from Tbilisi’s Western diplomatic corps (a meeting with the French ambassador to Georgia, Erica Fournier). Her aim here was to show that her main concern was the attitude of the West. And indeed it would be difficult to expect anything else from this former associate of Saakashvili, one of the leaders of the Rose revolution and at one point the President’s virtual deputy. The other current ‘non-systemic’ opposition leader, Irakli Okruashvili, can also hardly be considered pro-Russian. This is the former Minister of Defence and Internal Affairs who was personally responsible for the ‘defrosting’ of the South Ossetia conflict in the summer of 2004, the man who pledged to celebrate New Year in Tskhinvali and who likened the inhabitants of Russia to faeces eaters. The current opposition demonstrations in Georgia are also taking place against the background of change in the Middle East, which has had a considerable influence on post-Soviet opposition groups. One sign of this is the increasing activity of factions hostile to the governments of Georgia’s neighbours Armenia and Azerbaijan. Of course there are certain prerequisites for a repeat of the events in Tunisia, Egypt and Libya that led to the chain of revolutions that have become known as the Arab Spring. But at the same time the temptation to apply someone else’s experience to one’s own situation is always there. Another factor here is Western public opinion, which tends to see the Tunisian and Egyptian mass demonstrations as evidence of democracy and resistance to dictatorship. How accurate this assessment is, is a different question. "… it is possible to state with certainty that Georgian foreign policy after the hypothetical departure of Mikhail Saakashvili is unlikely to become pro-Russian." In this context, however the situation in Georgia may develop in the future, it is possible to state with certainty that Georgian foreign policy after the hypothetical departure of Mikhail Saakashvili is unlikely to become pro-Russian. No one should be deceived by Burdzhanadze or Nogaideli’s visits to Moscow - it is the role of opposition to criticise the government and seek out the chinks in its armour. In questions of territorial integrity and orientation towards Western countries and institutions both Burdzhanadze and Okruashvili will continue the course set by their predecessor. It is probable that, especially in the case of Burdzhanadze, this course will be followed less ham-fistedly, and will avoid head-on confrontation with Russia (hence her wish to test the ground in Moscow). But there should be no illusions on this matter. The maximum possible is to move the question from the ‘sacred’ to the pragmatic plane and bring an end to demonstratively hostile actions against the Russian Federation. We must leave it to historians to discover what specific considerations led the Georgian parliament (where the ruling party has a majority and is controlled by the Exchequer) to pass its resolution on the ‘Circassian Genocide’. An appeal from Circassian activists had been lying around in Parliament since March 2010. But it developed ‘legs’ in a few days when members passed the resolution in three readings after receiving the conclusions of four parliamentary committees. Saakashvili and his team may well have decided that a hardline stand-off with Moscow might be useful, to distract the population from their dissatisfaction with government policy and the economic situation. And rulers always have this card to hand, ready to deploy when the occasion demands. 2) The lack of a single, undisputed opposition leader. In the ranks of the ‘dissatisfied’ there are too many ex- senior officials who in their former lives were guilty not just of abstract transgressions, but of concrete misdeeds in their dealings with the ‘old opposition’. In a small country it is not easy to rid yourself of this baggage. 3) One cannot discount the possibility of support from the West. We are not of course talking conspiracy theories here. But between 2008 and 2011 Saakashvili more than once demonstrated his loyalty to the USA and NATO, for example in the deployment of Georgian troops in Afghanistan mentioned above, in contrast to the passivity of Washington’s European allies. And the West does not want another change of power in Georgia as a result of street demonstrations. In such a case all hopes of a successful democratic transformation will vanish into thin air. What, then are the main conclusions to draw from the events of May 2011? First, the extreme brutality of the Georgian special forces and Saakashvili’s emotional and conspirologically-tinged reaction indicate in the most explicit terms that the President of Georgia is prepared use desperate measures to retain (or indeed prolong) power. The application of such force against political opponents was clearly a deliberate act, designed to intimidate any one who might even dare to think about a change of regime. Second, the overly cautious reaction of Western embassies to the events in Tbilisi represents a real potential danger. The experience of 2008 shows that the absence of clear signals from Washington and Brussels is capable of creating an illusion of complete support for the Tbilisi regime, including openly antidemocratic government actions such as these. One might ask the uncomfortable question: what more does the Tbilisi government have to to its people do for the political class of western countries to become more critical in its dealings with this “beacon of democracy”? Third, after the events of August 2008, intervention by Russia must be considered highly unlikely. One would like to believe that the next rulers of Georgia, even if they are drawn from the ranks of the current opposition, will have a sound sense of its borders. In any case any Russian initiative in that direction would only confirm Western suspicions about the ‘real intentions’ of the Kremlin in 2008.